River cooters are commonly sold as pets along with other aquatics, i.e. red-ear sliders and map turtles. Hardy, and easy to keep as juveniles, these turtles become too large for most home aquariums. The genus Pseudemys includes several species of cooters and red-bellied turtles. Pseudemys concinna is the species known as the River Cooter. The name “cooter” may have come from an African word “kuta” which means “turtle. The river cooter is a large (12-16″ carapace) freshwater turtle. The carapace is rather flat, not highly domed. It is brown or olive with yellow/cream markings, which vary according to subspecies. The second pleural scute has a characteristic C-shaped mark. Older males may become very dark (melanistic) obscuring much of the carapacial design. Hatchlings have a central keel which disappears with age. The skin is olive to brown, with yellow stripes. Wide, sometimes dark-edged, stripes under the chin form an upside-down “Y.” The plastron is yellow and is marked with a large, darker pattern, at least anteriorly. The plastral pattern tends to fade with age. Males have a broader tail and may have a slightly concave plastron. Females tend to grow larger than males. Ernst, Lovich and Barbour (1994) lists five geographically based subspecies. P. c. concinna (Eastern River Cooter) from Virginia to extreme northern Florida (The pictured individual is P. c. concinna.) The stripe down the outside of the hind foot is an identifying characteristic. P. c. suwanniensis (Suwannee River Cooter) fromwest coast of peninsular Florida. While marked similarly to the river cooter, it lacks the stripe on the hind feet. This is one of the larger subspecies. P. c. hieroglyphica (Hieroglyphic River Cooter) from western Kentucky, Tennessee, Mississippi, Alabama and western Georgia. The carapace is intricately patterned and there is an indentation on the bridge. Plastral pattern is well developed. P.c. mobilensis (Mobile Bay cooter) from the Gulf watersheds of the Florida Panhandle to extreme southeastern Texas. It is smaller and lighter in color than other cooters. Its head stripes are red/orange. P. c. metteri (Missouri River Cooter) from southwestern Missouri, southeastern Kansas, south through eastern Oklahoma, eastern Texas, western Arkansas and western Louisiana. The carapace scutes are marked with vertical, curved stripes, rather than the usual reticulate pattern. The “C” may or may not be present. The plastral pattern is dark and clear. Iverson (1992) did not include P.c. mobilensis, considering it part of P.c. hieroglyphica. Ernst elevated P. gorzugi to full species status in an earlier paper, while Iverson includes it as a P. concinna subspecies. P. c. gorzugi (Rio Grande Cooter) from Rio Grande basin in Texas and Mexico and Pecos River basin in New Mexico and adjacent Texas. It does not have the usual “C” markings, but black and yellow concentric circles. In captivity, cooters need an aquatic habitat, with a dry basking area. They need a warming light and UVB radiation (from reptilelights or direct sunshine). As juveniles, they can be kept in a 20- or 30-gallon long tank, but they will outgrow those accommodations, and need a very large tank or outdoor pond. See a sample aquarium suitable for turtles under 6″ long. River cooters enjoy basking on logs or sun-warmed rocks, and are frequently found in the company of other aquatic basking turtles (sliders and painteds) sometimes piled up on top of each other. All are quick to slip into the water if disturbed. Diurnal by nature, these turtles wake with the warming sun to bask and forage. They can move with surprising speed in the water and on land. It is not unusual for them to wander from one body of fresh water to another, but many seem to develope fairly large home ranges, which they seldom or never leave. They sleep in the water, hidden under vegetation. While those that live in areas that are quite warm remain active all winter, river cooters in cooler climes can become dormant during the winter for up to two months, in the mud, underwater. They do not breathe during this time of low metabolism, but can utilize oxygen from the water, which they take in through the cloaca. River cooters perfer to be well hidden under aquatic plants during the winter dormancy period or while sleeping each night. As with the other basking turtles, the males tend to be smaller than females. Males sport long straight claws which are used as part of the mating dance. After detecting what may be a pheromone signal while sniffing at a female’s tail, a male river cooter will court a female by swimming above her, vibrating his long nails and stroking her face. Females have also been observed doing this to initiate courtship. If the female is receptive, she will sink to the bottom of the river and allow the male to mount for mating. Mating takes place in early spring. Nesting usually occurs from May to June. The female chooses a site with sandy or loamy soil, within 100′ of the river’s edge. She looks for a rather open area, with no major obstacles for the future hatchings to negotiate on their way to the river. The nest is dug with the hind feet. She lays 10 – 25 or more eggs in one or more clutches. Eggs are ellipsoidal, approximately 1 1/2″ long. Incubation time is determined by temperature, but averages 90 – 100 days. Hatchlings generally immerge in August or September. There have been reported instances of late clutches over-wintering and hatching in the spring. 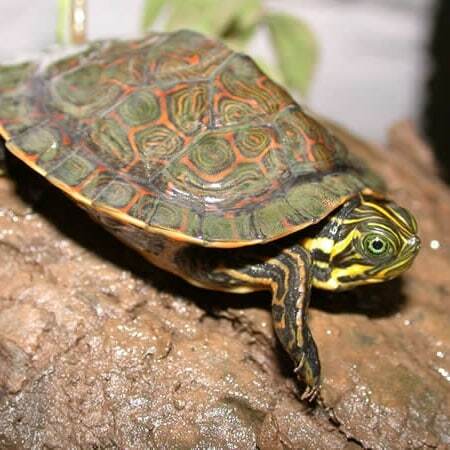 A hatchling will have a round carapace, about 1 1/2″ diameter, that is green with bright yellow markings. While the species is highly herbivorous, river cooters will eat anything, plant or animal, dead or alive. Diet seems to be determined by available food items. While some writers feel that these turtles will not eat meat, predatory behavior has been observed. Although this animal cannot swallow out of water, it will leave the water to retrieve a tasty bug or worm, returning to the water to swallow. Cooters will also enthusiatically chase, kill and eat small fish. They have also been observed eating carrion found along the river’s edge. River cooters have tooth-like cusps in the upper jaw, probably an adaptation to aid in eating leaves and fibrous vegetation. Their primary diet would include a wide variety of aquatic plants, and some terrestrial plants that grow near the water’s edge. They will happily take fallen fruits as well. In captivity, any kind of plant will be eaten, and some “meats”, too. Always keep calcium available in a separate form, such as a cuttlebone, so that the turtle can self-regulate calcium intake. These turtles can live 40 years or more. You can read about the complicated relationships between calcium, phosphorus, vitamin D3 and other elements at several websites. The point to remember is that phosphorus is in most of the foods that turtles eat. It is the calcium side of the ratio that demands attention. Providing calcium separately allows the turtle to decide when it needs more calcium. Cuttlebone, plaster block, boiled and crushed eggshells, and crushed oystershell can all provide calcium on demand. Just providing a good source of calcium is not enough, however. Dietary calcium is not properly utilized in the absence of vitamin D3. Turtles can manufacture D3 if provided access to UV-B rays from direct sunlight or a good reptile light (e.g. Reptisun or Reptile D-Light.) Or D3 can be provided in the diet through supplements like Rep-Cal. A few foods block the absorption of calcium because of their high oxalic acid content. It’s important not to overuse these foods, but they may have some benefits as natural vermifuge agents. Some foods contain goitrogens that can lead to iodine deficiency if overused. (Providing cuttlebone can correct this problem too, as it contains trace iodine.) High levels of protein put an abnormal stress on the kidneys, and may be implicated in some shell deformities. It’s best to avoid excessive use of meats intended for human consumption and other high protein food sources such as cat food or dog food. When used sparingly as part of a varied diet, no harm is likely to result, but high protein meats should not be used as a staple. It is important to use a great variety of foods, and not overuse any one type. Remember that plants provide protein too, so it is not difficult to get enough protein in the diet. In general, however, it all comes down to variety. If you feed just cantaloupe and crickets, there will be problems down the line. There’s nothing wrong with those foods. They’re simply insufficient. If you feed a wide variety of foods, the occasional use of cabbage, cooked beef heart or lettuce will not cause problems. Further, feeding some foods that are low calcium foods, or high in phosphorous or oxalates, will matter not at all if a separate source of calcium (cuttlebones/ plasterblocks/ eggshells/ crushed oystershell) is always available. This is more in keeping with the way turtles feed in the wild anyway. While some keepers carefully consider the calcium/phosphorus ratio, turtles don’t waste a precious second pondering the chemical analysis of their food. If it’s tasty and it’s there, they’ll eat it! Later, they’ll munch some carrion bones or birds’ eggshells and get caught up on calcium. It may be impossible for us to really “think like a turtle” but we can at least try. Turtles fed a wide variety of foods are happier and less likely to develop dangerous food fetishes.